The Uno Air Gate KL GK is a tested and proven unit which is used in production to eliminate electrostatic charges, dust and associated interferences in the best possible way. The exchangeable precision nozzles which are arranged offset in two rows shape the air stream into a defined flat jet. Once neutralized, the particles are mechanically removed by means of the air stream. 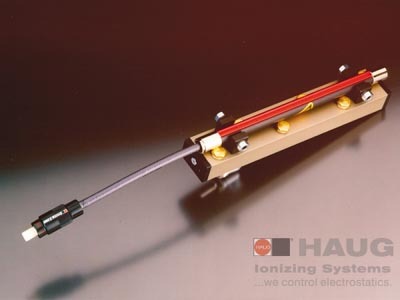 The HAUG ionizing bar EI Ex T is intended for use in areas with potentially explosive atmosphere. A suitable HAUG power pack provides the high-voltage supply. Surface charges which detrimentally affect production can be removed reliably and effectively, even at high operating speeds, by using the EI-RN ionizing bar. Special wear-resistant electrodes guarantee long service life. The ionizing bar is safe to touch. Apart from all other advantages of the standard version, the EI-VS ionizing bar satisfies the user by its considerably increased efficiency. Just as the EI-RN, the EI-VS is also fitted with the unique coax high-voltage connection HAUG System X-2000. Careful cleaning and maintenance ensure a long service life for HAUG air gates. Regular cleaning with the special cleaning system RS 1 and special cleaning agent SRM 1 is therefore a condition for consistently high efficiency of the equipment. Please order the ionizing bar separately!